How do I find out if my favourite course is already available in Birdie? Is Birdie available in a localized version for my language? Will there be a localized version of Birdie in my language? Does Birdie make use of the iPhone 3G's GPS for its range finder? How do I install Birdie updates? Are there additional costs for accessing course data? Is there an annual fee for using Birdie? My favourite course isn't available yet. How can I add it? 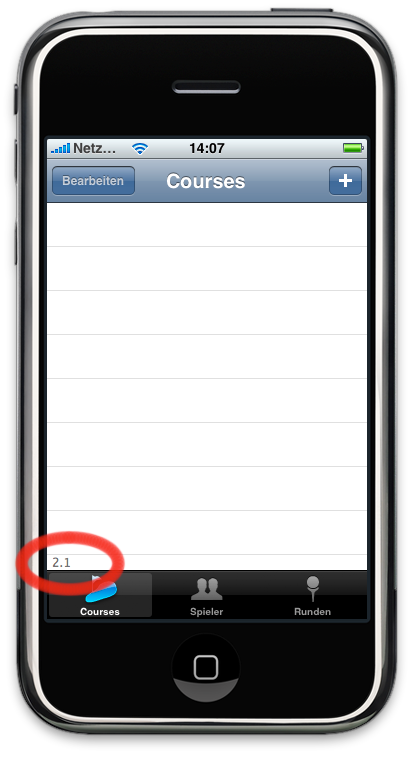 How long does it take until submitted course data is available in Birdie? Why the manual approval of course data? How can I add course graphics? There are errors or outdated data in a course's description data (resp. missing data). Can I edit the course description? Why is Birdie's range finder feature not available for my favourite course? Should I add a new variant for each tee color of a course? I accidentally edited course data but I don't want to make any changes on the course. What now? When adding a 9 hole course, do I need to enter all holes again for the 2x9 hole variant? How to enter a 27 hole course? What's new in the current version of Birdie? How can I tell which version of Birdie is on my iPhone/iPod touch? I have a question which isn't answered here. How do I get support? Is there a telephone support? Please use the Course Lookup page to search for the availability of a specific course. The course lookup page also finds nearby courses. Simply enter the name of a city and click "Look up". No. The range finder works with the iPhone's touch interface. Hence, the range finder is also usable on 1st gen iPhones as well as the iPod touch. The only requirement for using the range finder is the availability of course maps in Birdie's course data (see previous Q/A above). Watch the tutorial movie "During the Round" for an example of how it works. The main problem with the iPhone's GPS unit is its relatively low precission. The current hardware deliveres only results with +/-17 meter (about +/-18 yards), most of the time even worse. That's why a usage of these GPS results for a range finder feature makes currently not very much sense (at least if used for more than only "eye candy"). As soon as the hardware situation changes, we'll use GPS for a range finder feature, of course. Please use the Online Course Editor to add course data to Birdie's database. There are no annual fees for accessing our course database. Our database contains data for tens of thousands golf courses around the world and Birdie grants access to all of this data without any hidden costs or annual fees! Usually between 5 minutes and 12 hours, mainly depending on the time of day of your submission. Normally, your submission should be processed within just a few minutes. Please note that Pleasant Software is based in Germany, i.e. our buisness hours are in the CET/CEST timezone (kind of...). Because we like to keep Birdie's course database as well-organized and tidy as possible. I.e. we filter out "spam" and "test" submissions, whenever possible, we try to gather all courses of one golf club into one record and so on. This way we try to avoid a cluttered and bloated database with duplicate or insufficient course descriptions. Please see this page for more information on this. Please use the Online Course Editor to enter and submit changes to existing course data. You find a complete list of changes on the version history page. You can contact our support by eMail. Please send your support request to support (at) pleasantsoftware (dot) com. Please give us a few business days to respond! We get lots of e-mail. No. Because we're busy coding, we cannot provide technical support via the phone. We ask you please e-mail us instead! . Please send your support request by eMail to support (at) pleasantsoftware (dot) com. When adding a 9 hole course, do I need to enter all holes twice for the 2x9 hole variant? No. First, create the 9 hole variant and add the data for the 9 holes. Then use the "Derive 2x9" option to automatically create the 2x9 hole variant from the just entered data. The range finder feature is only enabled when course maps are available for a course. Since the map images are usually protected by copyright of the golf club, we need a signed permission from the images' copyright holder in order to use them in Birdie. If you're interested in seeing course maps of your favourite course in Birdie, please see this page for more information. No! Please create only one variant per course and add all tees to this variant ("Add tee"). Please use the option "Discard" for the course on the editor's main view. This option discards all your latest changes to the course's data but leaves the original course data untouched. First, create three variants for the three 9 hole courses. If there's no separate course rating for the 9 hole variants available, just leave the CR/SR fields empty. Then create a new variant for each course combination ("Course A+B" etc.) and use the "Derive Holes from..." option and popup menu to combine the respective two 9 hole variants you just entered before. Finally click on "Edit Tee" for each tee in the combined variant to enter the correct course rating for each tee. The course editor automatically solves collisions in the HCP/S.I. column when combining the 9 hole variants. In addition to that, you might want to enter custom hole numbers (e.g. "A1", "A2", "A3" etc. for "Course A"). Use the "Add or edit description texts to the holes" option for this. The version is displayed in the lower, left corner of the scree for about 1 - 2 seconds, when launching Birdie. Select "Apps" in the iTunes navigation sidebar. Then select Birdie in the main window and open the information dialog ("File" > "Information", keyboard shortcut cmd-i (Mac) resp. ctrl-i (Windows)). App updates, like purchase and installing of new apps, is handled directly by Apple. On the iPhone/iPod touch, app updates are handled by the App Store application. If updates are available, the number of updates is displayed on a badge on the App Store app. After launching the App Store app, you can select single or all available updates in the "Updates" tab. Select the Apps section and click on the "Check for Updates" link in the lower, right corner of the window. We'd love to include your language in Birdie's localization! If you'd like to volunteer to translate Birdie, please contact us and we'll send you Birdie's "Localized Strings" file for translation. It's a text file, containing about 300 strings to translate (most of them are 1 to 3 words only, like button titles etc. ).